Society and popular culture tell us that visiting the dentist should be scary. We disagree. The team at Winneconne Family Dentistry take every possible step to make sure your visit is painless, relaxed and that you are at ease throughout. This begins the moment you meet Dr. Ryan. 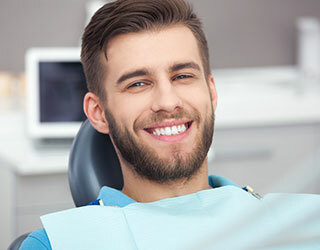 He always takes the time to get to know his patients and will talk with you in-depth about your concerns, your past dental experiences, your oral health goals and your treatment. Our team of professionals work hard to ensure your experience with us is second-to-none by providing extra comforts like blankets, pillows and essential oils. Your comfort is our number one priority. Dr. Ryan and his team are proud to be able to offer enhanced relaxation treatments to make your treatment experience the best ever. One way we do that is with nitrous oxide – laughing gas – a safe sedation option used for many decades. Another way we can make you relaxed and comfortable is by using sedation dentistry. While this sedation is not the same as general anesthesia, it often allows patients to sleep through their procedure. You will awaken with a beautiful smile and no memory of the treatment. Best of all, we can accomplish all of your procedures the same day while you are under sedation. Dr. Ryan offers free sedation dentistry consultations. To schedule your sedation dentistry consultation, please contact us at (920) 582-4427.